It's day 3 of the summer 10x10! Sunday usually involves church in the morning but I stayed home today because I had a feeling Isaac's sleep would be thrown off from all the family fun. I was 100% right. We do have plans to get dinner with friends tonight and I think this look works so well as a weekend outfit. I can see myself wearing this to the farmer's market, to brunch or a coffee date or a burger joint (which is where we'll be dining tonight). This outfit screams Madewell even though none of the pieces are from there. I didn't set out to replicate Madewell's styling but it's really easy to do with Target's Universal Thread collection – which is so heavily inspired by Madewell, it’s hilarious! I'm not complaining, though. I'd been waiting for Madewell to make a lightweight cotton shirt in this olive color for over a year. Target just beat them to the punch! And the fact that I scored this for under $20 is a definite plus.. I bought this top while I pregnant because I couldn’t resist the olive green color. I sized up to accommodate my baby bump so now it has more of an oversized, boxy fit. I love it. It’s also great for nursing thanks to the buttons! I picked up the green bandana from Target (also the Universal Thread collection) the other day. I was so excited to find a bandana in an earthy green color since I’ve been on the hunt for one for a while! 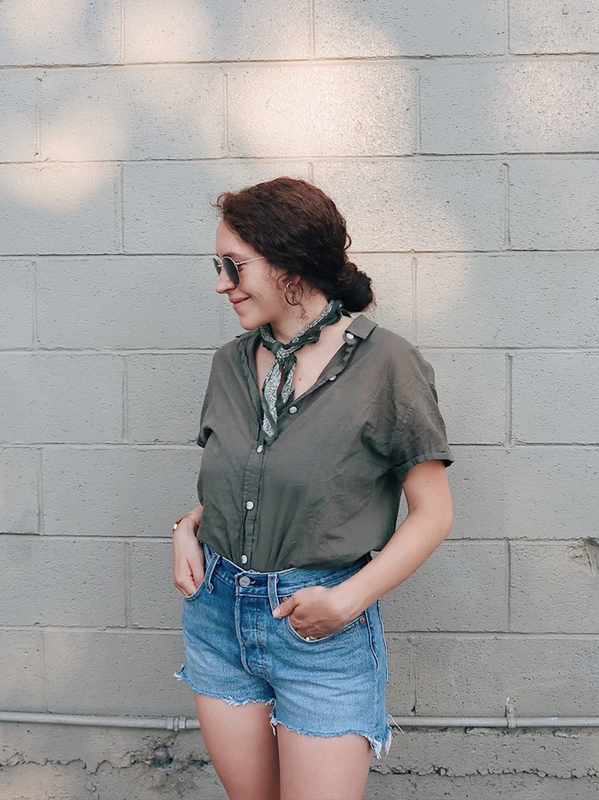 I love my little collection of bandanas because they’re so versatile – I love wearing them around my neck (especially now that my favorite necklace broke) but they’re also fun with a top knot or braid. I’m actually looking forward to finding a way to wear a bandana in my curly hair. 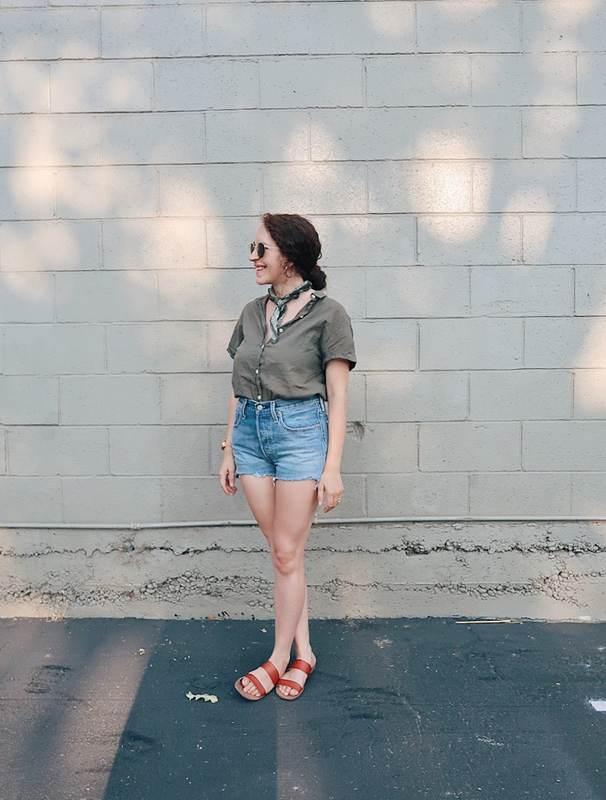 All in all, the oversized button up, the high waist denim shorts, the bandana around the neck and the vintage-inspired sunnies make for a Madewell-esque outfit with a much smaller price tag. Not bad for someone who doesn’t want to spend a bunch of money on a top that will inevitably get spit up on it. Ha! That’s it for day 3! A cool, easy outfit that can go from church to burgers without compromising nursing access.